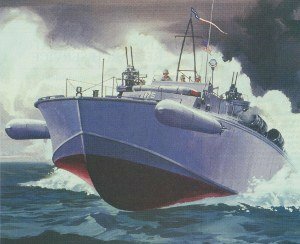 PT boats stands for patrol torpedo boats – Why the US Navy didn't adhere to the internationally recognized term "Motor Torpedo Boat" is a mystery. They are, after all, functionality the same thing. An example of the 80ft Elco PT boats. Motor Torpedo Boats were developed in the dawn of the 20th century. The great navies of the world were wrapped up in an arms race building bigger and faster capital ships with ever more and heavier guns, and with thicker armor protection. All navies, big and small were looking for ways to upset the stalemate. The submarine and the Motor Torpedo Boats were developed as powerful weapons to challenge even a vastly superior battle fleet. There were three principal manufacturers of these boats that have their names associated with US navy PTs of WW2. Follow the link above to learn more about them. I've developed three sets of semi-scale plans for the PT-109. Follow this link for more info about the 1:32 and 1:24 scale versions. For more about the *NEW* Giant 1:16 scale version, click here. Here is a list of static model kits. The list include plastic, resin, wood and paper (card) kits. Most of these kits are still in production, while some are not. For instance, the Lindberg 1:32 PT-109 is OOP, but is a very important kit in this context. It comes up on Ebay quite often actually. Not surprising, most kits are of PT-109 and other Elco 80 ft PTs. This list and review includes models that are either directly intended for RC or of plastic model kits large enough to be considered for an RC conversion. The list is as a result of looking high and low for a low cost alternative. I had no luck finding anything that suited my budget, so I decided to scratch build my own. This is a write-up on how to build a simplified semi scale PT 109 or any other PT-103-class Elco 80-footer. This article series also serves as a how-to to go along with the PT-109 plan that I sell. Part Two: Assemble the hull frame. Part Four: Adding hatch coaming and deck to the model. Part Five: Building the Deck Houses. Part Six: Building the MG Turrets. Below is a sampling of books if you want to learn more about the Patrol Torpedo Boats from World War Two. If you'd like to review a book on this subject, or would like to recommend a different book, use the form below.